Stephanie and Greg had an impeccable vision for their big day at the Bella Collina Mansion in Montverde, FL. Their magical wedding featured Italian influences, classic style and an abundance of hilarious and heartfelt moments. Stephanie got ready with her mom and bridesmaids close-by, all in matching robes. 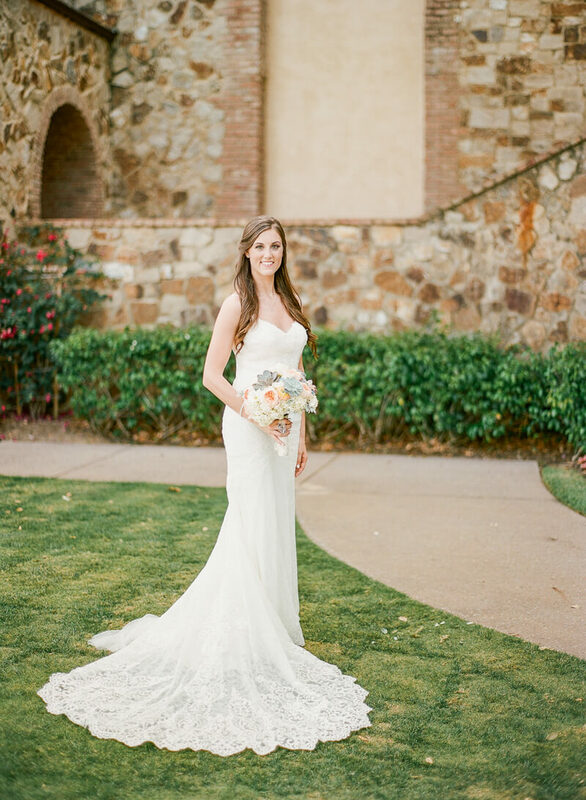 With the help of her mom, sister and future mother-in-law, Stephanie pulled on her lace fit-and-flare gown. She wore her hair halfway up with soft curls and chose embellished open-toe heels, a bracelet and long veil to complete her bridal look. Greg and his groomsmen played pool and hung out in the locker room before the ceremony. Greg wore a navy blue tuxedo with a long white tie and matching brown shoes and belt. 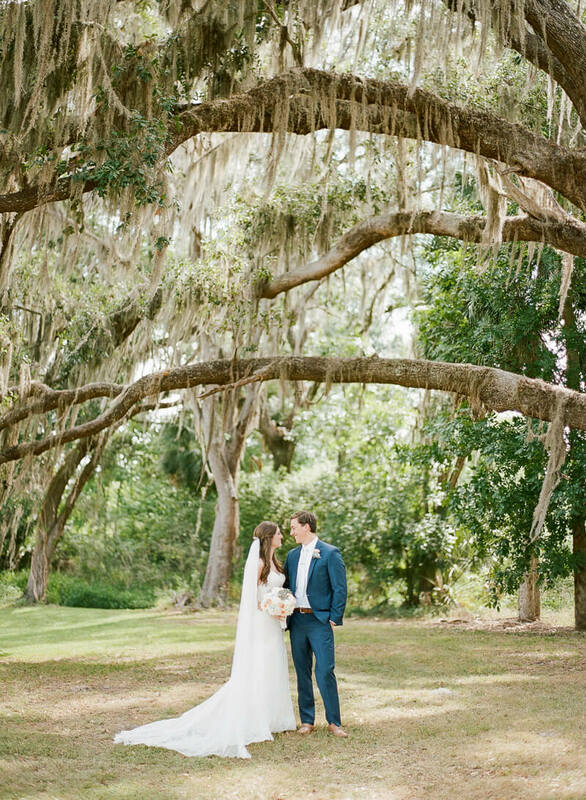 The couple agreed on a first look before the ceremony to take advantage of their gorgeous wedding venue. 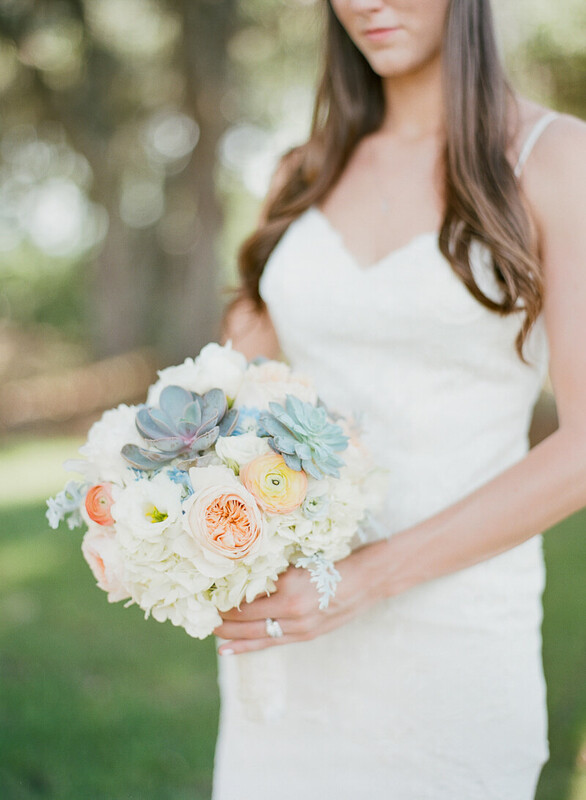 Her lovely bouquet featured soft pastels of garden roses, ranunculus, hydrangea, dusty miller and succulents. Greg’s groomsmen also matched in navy blue tuxedoes but wore dusty blue ties to incorporate the wedding colors. For their symbol of unity, the couple placed letters and a bottle of wine in a personalized wooden box. After group photos, it was time for the ceremony. Stephanie was escorted down the aisle by her father and she greeted her groom in front of the mansion’s arches and grand chandelier. Reception tables embraced the Tuscan aesthetic of the property. Dark chivari chairs were paired with white linen-covered tables that featured lantern centerpieces and white china. At each place setting, guests were offered a bottle of olive oil and jar of spices as a nod to the venue’s Italian influence. The weather was perfect for their outdoor reception. 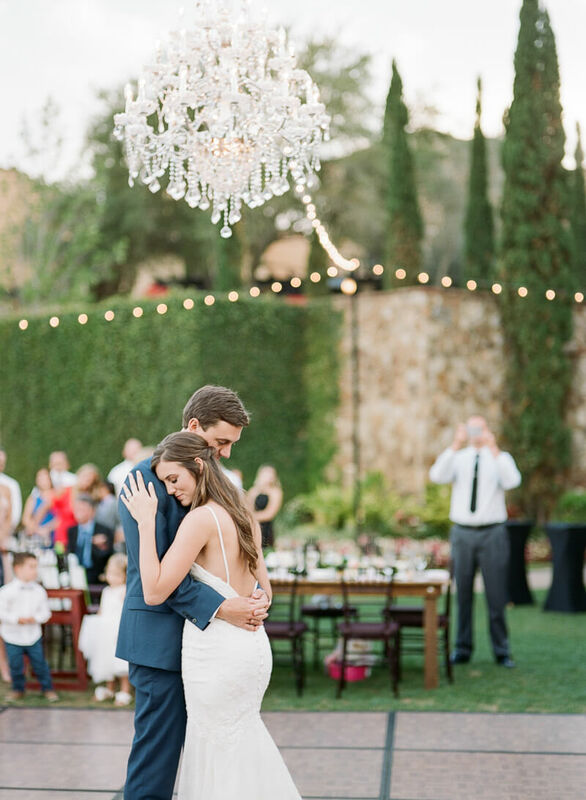 String lights and an impressive chandelier hung above the dance floor to provide a romantic glow as the sun fell behind the horizon. 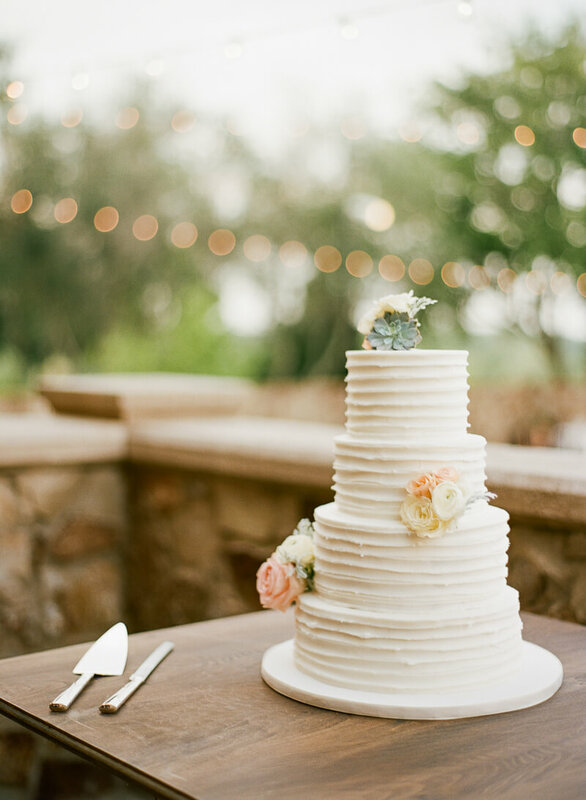 As ornate as the rest of their wedding details, their cake was remarkably simple and sweet. It featured four white tiers with the delicate placement of their wedding flowers on the top and sides. After dinner, everyone joined the couple on the dance floor and celebrated long into the night. The bride and groom made their exit just past midnight amid a flurry of sparklers. Stephanie and Greg let their hearts be their guides when it came to planning their big day. With a stunning venue, beautiful florals, spectacular attention to detail and heavy dose of fun, their wedding was an enchanting party from start to finish.